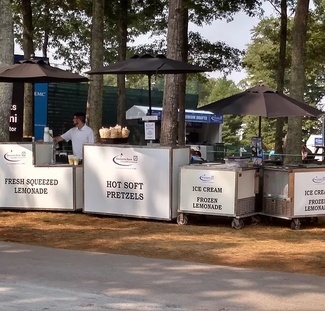 The Charlotte Chorale is looking for volunteers to work at refreshment stands throughout the Wells Fargo Championship on our behalf. Volunteers will be selling ice cream, soft pretzels and fresh squeezed lemonade at each stand. A percentage of refreshment sales will be donated to our organization. Quail Hollow Country Club is a beautiful setting and the Wells Fargo Championship is a great event. If you agree to help us, you will get into the golf tournament for free. You can arrive early before your shift and watch the players, or you can stay once your shift has ended and watch top golfers from around the world compete for the top prize. On behalf of the Charlotte Chorale, thank you for your continued support and your consideration for participating in our fundraising activity. There are 7 of us total that are going to be volunteering together! Looking forward to this event. Thank you! My wife and mother-in-law will be helping out. With Daniel Barreto. Please put us by the 10th tee if possible. Thanks! Please put us on hole 17 if available. With John Rimer. Please put us next to 10th tee if possible. Thanks! My fiancé may be able to help also. She has to see her work schedule. My husband will be volunteering as well.